Millions of registered users have played with MIT’s Scratch, the interface that helps you learn to code by snapping Lego-like colored blocks together. The new browser-based version will include blocks for making surveys and Webcam-based games. But will the fact that it’s being written in Flash repel its target audience? This week, the MIT Media Lab launched a new version of Scratch, called Scratch 2.0, which moves the programming community into the cloud, so members can examine, experiment with and remix one another’s programs directly in the web browser, without any uploading or downloading. As with earlier versions of Scratch, young people create computer programs by snapping together colorful graphical blocks. 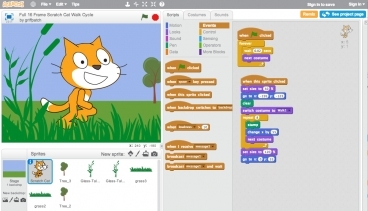 In Scratch 2.0, there are new blocks for creating new types of projects, such as online surveys and games that respond to real-world movements (by using webcams as sensors). Community members can also create their own custom blocks from existing blocks — and share their new blocks with others…. As NMD’s Mike Scott noted, Scratch has been completely rewritten in Adobe Flash for version 2.0, though it will still run projects from older versions of Scratch. There is an iOS viewer planned for the future, but in the short term the team would seem to be undercutting one of its most promising audiences: schoolkids on iPads. The ability to drag and drop components via multitouch would seem to be a natural fit for young fingers. Which makes Flash’s inability to run on iOS less a killer feature than a killer feature killer. To justify any salary, it’s not only about what you know – now – but what you can learn going forward. The key to a long career in Silicon Valley, or anywhere in the tech world, is showing that you can learn and adapt – and master – constant change. One thing that may not change any time soon is a basic understanding of code. Numerous industry analysts–not to mention celebrities from Bill Clinton to Snoop Dogg–have recently advocated that all US students learn to write their own code; dozens of their testimonials are compiled on Code.org. Ad exec Kirk McDonald made a stir in the Wall Street Journal with the article Sorry, College Grads, I Probably Won’t Hire You. I’m your next potential dream boss. I run a cool, rapidly growing company in the digital field, where the work is interesting and rewarding. But I’ve got to be honest about some unfortunate news: I’m probably not going to hire you. This isn’t because I don’t have positions that need filling. On the contrary, I’m constantly searching for talented new employees, and if someone with the right skills walked into my office, he or she would likely leave it with a very compelling offer. The problem is that the right skills are very hard to find. And I’m sorry to say it, dear graduates, but you probably don’t have them…. I don’t mean that you need to become genius programmers….What we nonexperts do possess is the ability to know enough about how these information systems work that we can be useful discussing them with others….even if your dream job is in marketing or sales or another department seemingly unrelated to programming. Thankfully, there are success stories–like the 17-year-old girl who just won a TV programming contest. She knew something about programming–but she was also able to picture a service she needed as an app everyone could use. Jenny Lamere, a graduating high school senior from Nashua NH, was the youngest of 80 participants (and one of only four women) in the Hill Holiday TVnext hackathon held in Boston this past April, a programming contest sponsored by TV API providers. Her submission of ‘Twivo,’ an app that allows TV viewers to block spoiler tweets while watching a show and recover them later, won the contest’s ‘Sync to Broadcast’ category (one of five), and was also named the event’s ‘Best in Show’ (overall winner).